Russian President Vladimir Putin called on former Soviet states to prevent the distortion of history honoring common victory over Nazism in the World War II. MOSCOW (Sputnik) — Russian President Vladimir Putin called on former Soviet republics to prevent the distortion of common history in a congratulatory message on the upcoming Victory Day, Kremlin’s press service said in a statement on Sunday. The message was addressed to the leaders of Azerbaijan, Armenia, Belarus, Kazakhstan, Kyrgyzstan, Moldova, Tajikistan, Turkmenistan, Uzbekistan, Abkhazia, South Ossetia, as well as to citizens of Georgia and Ukraine. 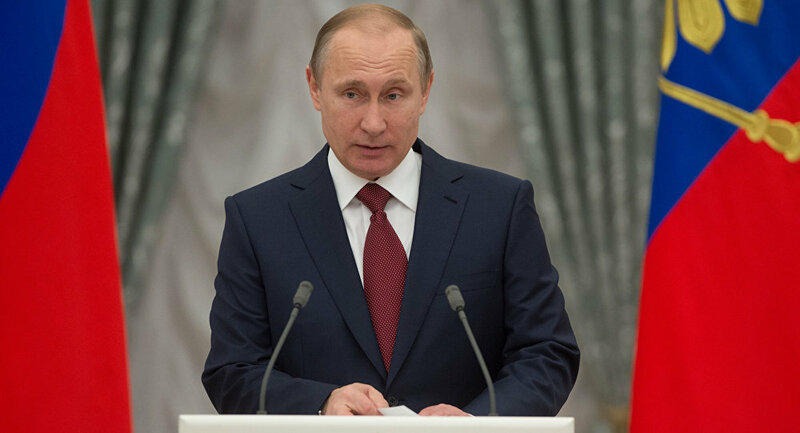 "Congratulation the countries on the Victory Day, Putin emphasized inadmissibility of reviewing the history, repetition of the tragic events of the past," the statement read. ​Putin also urged to cherish the memory of those who perished during the Great Patriotic War and to take care of veterans who are still alive, the press service added. "Victory Day is a sacred holiday that will forever remain a symbol of heroism and unity of peoples, who defended their homeland in bloody battles and saved the world from fascism," the statement cited Putin as saying. Russia and the post-Soviet states mark the Victory Day annually on May 9, commemorating the millions of Soviet soldiers and civilians, who died in the war with Nazi Germany and its allies. A large-scale military parade will be held Monday on Moscow’s central square as part of the celebration of the 71st anniversary of the end to WWII’s.